My neighbor had a very old cabinet that he didn’t want anymore. It was full of engine oil, had been painted and left sitting out in the rain/snow for months. There were sliding doors on the original piece. The rails remained but the doors were gone, I’m not sure what it was originally. I asked if he was going to do anything with it and he said it was mine. I took the top off, which had already been replaced with 3/4″ plywood and replaced with with a beautiful piece of wood that I purchased from Menards. 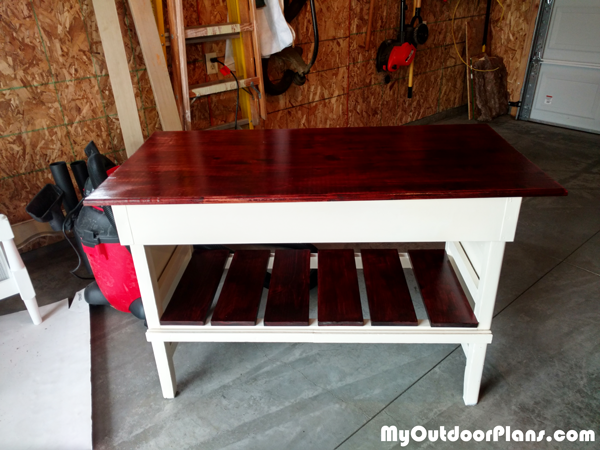 I routered the edge just to make it more decorative and stained it a darker almost mahogany colored stain and then put a couple coats of clear poly to seal it all. Where the shelves were before, I removed them and replaced it with slats of wood. My son was newly married and they didn’t have a cabinet for their tv and toys. so I made sure that I left sufficient space in between the slats so that air could circulate around the cable box etc. I painted the body of the cabinet an off white so it would fit in with whatever their color scheme was going to be. So the cabinet was free, the piece of wood was about $30, paint for the rest was about $10. The slats I had used a piece of pine that I had left over from another project and cut them to size. Stain and poly was another roughly $18.